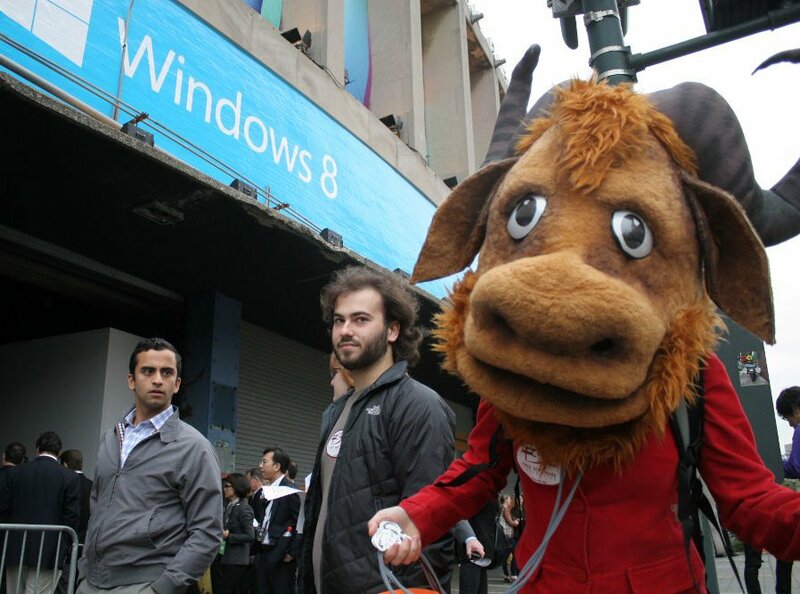 Standing with the gnu, Libby Reinish, FSF campaigns manager, explained why it was necessary to make Windows 8's restrictions on freedom a big part of the conversation around the operating system: "Microsoft has already spent almost two billion dollars on slick advertisements to convince people that Windows 8 will revolutionize the way they use computers. The fact is, it's basically Windows 7 with new surveillance 'features' and even more restrictions on users' freedom. Whether or not Microsoft wants you to know it, it's easy to switch to free software instead of choosing a downgrade to your rights as a computer user -- for example, your rights to know what the system is doing and to change behaviors you don't like. We're here because we want people to know that they don't have to buy Windows 8 -- this is a great time to upgrade to free 'as in freedom' software." Today's action is the beginning of a new FSF campaign around Windows 8, which will track the proprietary operating system over the coming months and continue to cut through the marketing hype to explain the problems with the OS. The FSF plans to launch a Web site with a full-scale campaign, including grassroots participation, and future physical and online actions. The initial home of the campaign is http://www.fsf.org/windows8, where visitors are invited to sign an online pledge to skip Windows 8 and upgrade their computers to a free software operating system. FSF executive director John Sullivan discussed his plans for the campaign: "There's been plenty of talk in the media about whether Windows 8 will be annoying because it has no 'Start' button or because its Internet desktop will make it slow and glitchy. The deeper problem is that it is restrictive and damaging to your freedom as a computer user. We will make sure that, no matter what Microsoft's advertising is focused on, computer users still have a chance to learn about the fundamental issues with proprietary operating systems, and about the path to something better." The campaign comes at a time when SOPA/PIPA and CISPA have thrust Internet freedom issues into the spotlight. The FSF applauds this focus on computer users' rights, but believes it also requires a focus on free operating systems. Even when Web sites do not restrict and spy on their users, operating systems increasingly do. A truly free Internet, they say, cannot exist unless it is accessed with a free operating system.